Many web applications need to authenticate and authorize its users. A common approach is to accept user name and password from the user and validate them against some data store. 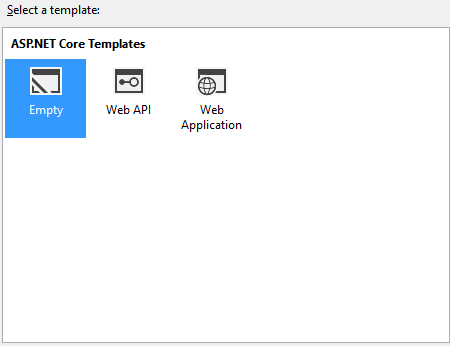 As far as ASP.NET Core web applications are concerned the recommended way to implement such a security using ASP.NET Core Identity. In this article you will learn to implement user authentication as well as role based security using ASP.NET Core Identity. You will do so by building a sample application from scratch using the empty project template. Step 6 : Create AccountController - the controller containing registration / login / logout code. 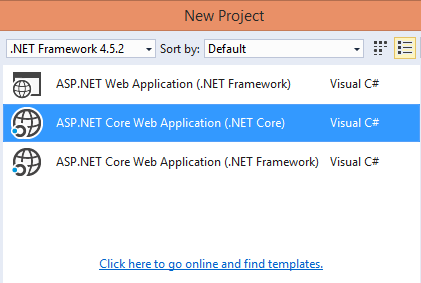 Create a new ASP.NET Core Web Application using Visual Studio 2015. Make sure to select the Empty project template while creating the project. Notice the NuGet packages marked in bold letters. They are required for ASP.NET Core MVC, Entity Framework Core and ASP.NET Core Identity. Our sample application being built stored user names and passwords in a local SQL server database. To talk with this database you need an IdentityDbContext class. The IdentityDbContext needs to know what "type" of users and roles it will be dealing with. Thus you also need to create user and role classes. The MyIdentityUser class shown below represents our application user. As you can see the MyIdentityUser class inherits from IdentityUser base class (Microsoft.AspNetCore.Identity.EntityFrameworkCore namespace). The IdentityUser base class contains basic user details such as UserName, Password and Email. We also want to capture FullName and BirthDate of a user. So, we add these additional properties in MyIdentityUser class. The MyIdentityRole class inherits from IdentityRole base class. The base class provides details such as RoleName and we add Description as an extra piece of information. If you don't want any additional details to be captured you could have used IdentityUser and IdentityRole classes directly. Now that user and role classes are ready, let's create IdentityDbContext class. The MyIdentityDbContext class inherits from IdentityDbContext base class. Notice how MyIdentityUser and MyIdentityRole types are passed while creating the MyIdentityDbContext class. The third parameter is the data type of the primary key for the user and role classes. Notice the code marked in bold letters. The ConfigureServices() method calls AddDbContext() method to add MyIdentityDbContext to the services collection. Notice how the database connection string is specified. Then AddIdentity() method is used to add ASP.NET Core Identity services to the container. This is where MyIdentityUser and MyIdentityRole classes are also mentioned. The Configure() method calls UserIdentity() method to add ASP.NET Core Identity to the request pipeline. We need two view models - RegisterViewModel and LoginViewModel - in our application. These view models hold the data entered on the register and login views respectively and are used by the AccountController we create later. As you can see, the view model classes are quite straightforward. The RegisterViewModel class has six properties namely UserName, Password, ConfirmPassword, Email, FullName and BirthDate. The LoginViewModel class contains three properties namely UserName, Password and RememberMe. Various properties of the view model classes are decorated with data annotation attributes for the sake of model validation. The AccountController class is a controller that performs registration, login and logout operations. The AccountController uses the functionality of ASP.NET Core Identity for creating user accounts and signing the user in and out of the application. The AccountController declares three private variables of type UserManager<T>, SignInManager<T> and RoleManager<T> respectively. The UserManager class is used for creating and managing users. The RoleManager class is used for creating and managing roles. The SignInManager class is used to log a user in and out of the system. Object instances of these three classes are injected into the AccountController constructor as shown above. The constructor code simply assigns the injected objects to the respective variables declared earlier. The Register() action with no parameters simply returns a blank registration page to the user. The second Register() action accepts RegisterViewModel object as its parameter. Inside, the code checks whether the model contains valid data or not using the IsValid property of ModelState object. If the model is valid we create a new MyIdentityUser object and assign its UserName, Email, FullName and BirthDate properties. Then the code calls the CreateAsync() method of the UserManager class in an attempt to create a user account. The password is passed to the CreateAsync() method. Since the CreateAsync() is an asynchronous call, we block the execution by calling the Result property. The CreateAsync() method returns IdentityResult - an object that tells us whether the user creation was successful or not. If the user creation succeeds (result.Succeeded property) we proceed to create the roles required by the application. The role creation is a one time operation. It should happen only if a role doesn't exist already. So, the code uses RoleManager to check whether a role already exists or not. This is done using RoleExistsAsync() method and by passing role name as its parameter. If a role doesn't exist already, MyIdentityRole object representing that role is created. Its RoleName and Description properties are assigned the required values (NormalUser is the role name in this example). Then CreateAsync() is called on RoleManager in an attempt to create the role. If the role creation succeeds (Succeeded property returns true) we add the newly created user to the NormalUser role. This is done using AddToRoleAsync() method of UserManager. After creating the account and adding the new user to the NormalUser role we redirect the user to the login page. The two Login() actions are discussed next. The first Login() action simply returns a blank login view to the user. When a user enters user name and password and submits the form the form is posted to the second Login() action. The code then attempts to log the user in by calling the PasswordSignInAsync() method of the SignInManager. The PasswordSignInAsync() method accepts user name, password and remember me flag and account lockout flag. 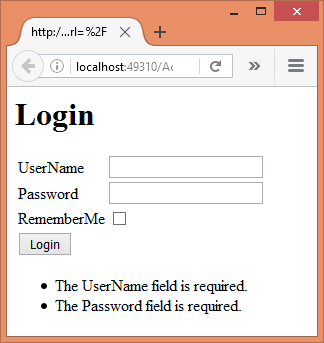 ASP.NET Core Identity uses cookie based authentication scheme to authenticate requests. The remember me flag controls whether the authentication cookie is to be persisted on the client machine when the browser is closed. A value of true will persist the cookie. We accept this flag from the end user using a checkbox (as you will see later). The lockout flag comes into picture only when you are using account lockout feature (account is locked after certain number of unsuccessful attempts). In this example we aren't using account lockout and hence we pass false. If the user name and password are valid the PasswordSignInAsync() method will issue the authentication cookie and Succeeded property will be true. We then redirect the user to the /home/index page. The SignOutAsync() method of SignInManager removes the authentication cookie. Since this method is a void method we call Wait() on it to block the call. Once a user signs out of the application we redirect the control to the login page. 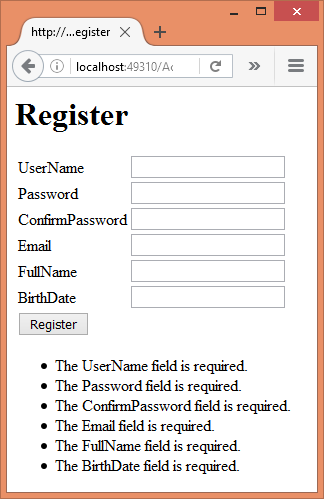 The Register view consists of a form tag helper that submits to Register action of the Account controller. The form further uses label and input tag helpers to render the respective data entry fields. Notice that the form also uses certain script files that are used during the client side validation. You can place these files inside the Scripts folder under wwwroot folder. There is a <div> element at the bottom that uses validation summary tag helper and displays all the validation related errors. The HomeController's constructor receives a UserManager object through ASP.NET Core DI framework. It stores the injected UserManager in a private variable. The Index() action is secured by decorating it with [Authorize] attribute. This way you won't be able to invoke Index() unless you log-in first. The Index() action retrieves the name of the current user. This is done using the GetUserAsync() method of UserManager. Notice the use of HttpContext.User property to retrieve the underlying security principle of the current user. A welcome message is then formed using the FullName of the user. 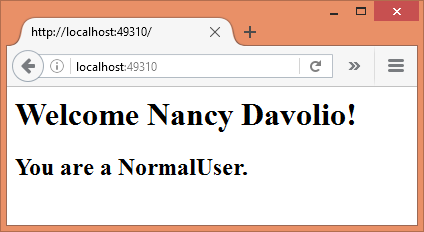 Further, the IsInRoleAsync() method checks whether the current user belongs to NormalUser role. If so, a message is stored in the RoleMessage property of the ViewBag. After issuing the first command Migrations folder will be added to your project and EF migrations related code will be generated for you. The second command applies those migrations to the underlying database. That's it! You can now run the application. Test the functionality by creating a couple of new user accounts and then try signing in with those credentials.